It’s now been 2 years since I said goodbye to my lemon of a car and never looked back. 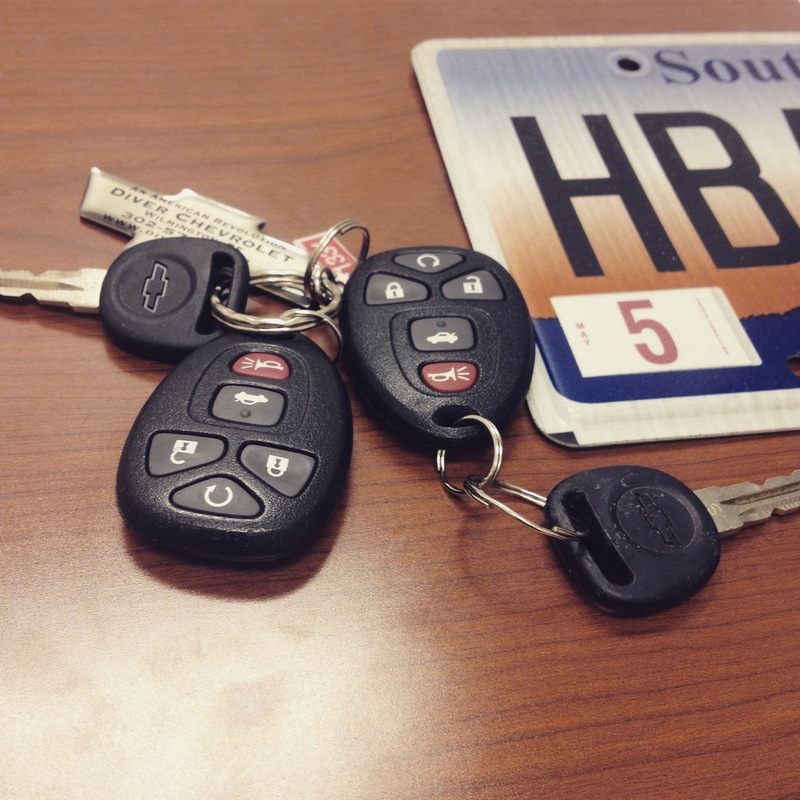 I still have this picture in my camera roll because it’s a favorite memory now; I remember the feeling of nervous-impatient-anticipation leading up to turning in these keys and walking away (OK, I did get a ride back from the dealership, it was a ways outside of Greenville). Later that day I was riding my bike downtown with this euphoric buoyant feeling, and I realized it felt like an actual weight off my shoulders not to own, maintain and stress over a giant hunk of treacherous machinery. It’s hard to pick a best and worst thing about not having a car. Life is a lot simpler because I don’t feel obliged to go to events on the other side of town where the traffic is abysmal. 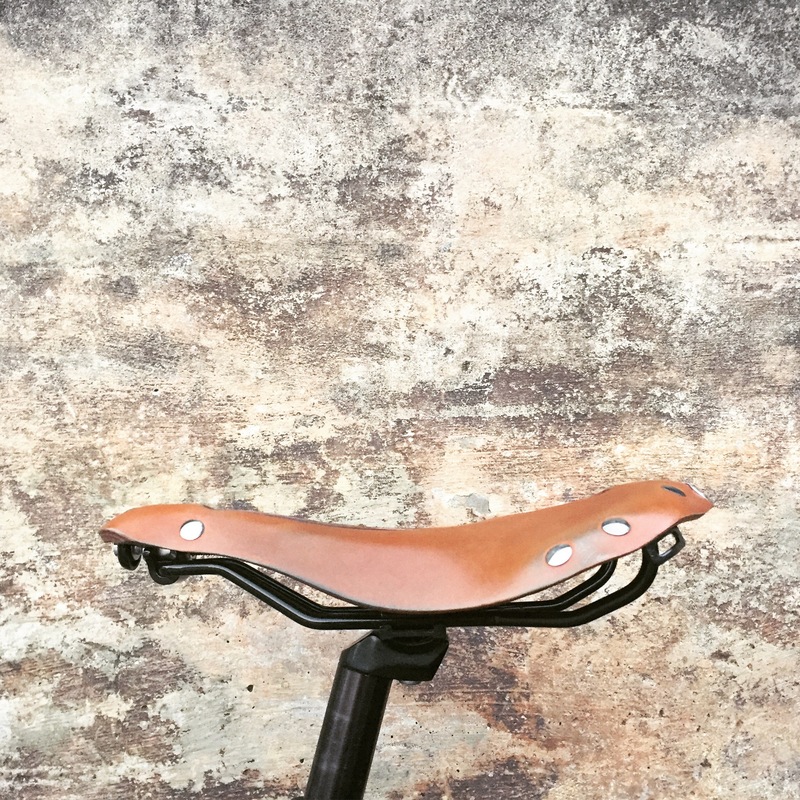 Purchasing is more intentional because I’m not tempted by regular Target runs and thrift store pop-ins, and I tend to shop locally at stores in bike/pedestrian friendly areas where I get to know the owners and only buy what I need. I’ve always been a couch potato, but now I’m in the best shape of my life and don’t go to the gym. Without the expense of car payments, insurance, maintenance, gas or property taxes, I’ve eliminated most of my stress about money (while living on a teacher’s salary) and can spend money on things I enjoy such as travel, good food, and charitable causes (and some new wheels once in awhile). The worst thing is probably the lack of cycling infrastructure where I live. To me, this is a challenge that makes it feel like a satisfying accomplishment to get somewhere that most people wouldn’t think of going on a bike, whether I use back roads, take the bus, or just take the lane. It also feels like a vote (and sometimes a middle finger) against whoever decided cars were the only viable way to get around. Hopefully at the same time I’m inspiring someone else out there, and that’s more than I could say when I drove my car. Not that I can’t abide driving whatsoever. I still have to occasionally borrow or rent a car or uber for practical reasons once in awhile. But once the excitement of obtaining a drivers license wore off and the realities of the economic, health and environmental tolls set in, the car lost its magical allure for me. I couldn’t manage to feel good about driving being a regular part of my day or a necessary part of my world. I’m more satisfied with my choice than ever on this anniversary, and I look forward celebrating to many more down the road. It reminds me of looking at a hill from a distance, thinking good lord I’ll never make it up, but you focus on the ground right in front of you, and next thing you know you’re halfway through it. Now I just have to keep this in mind for travel planning, because currently I’m stalled out trying to make everything happen. One pedal at a time.. I achieve this on about 1% of my rides. 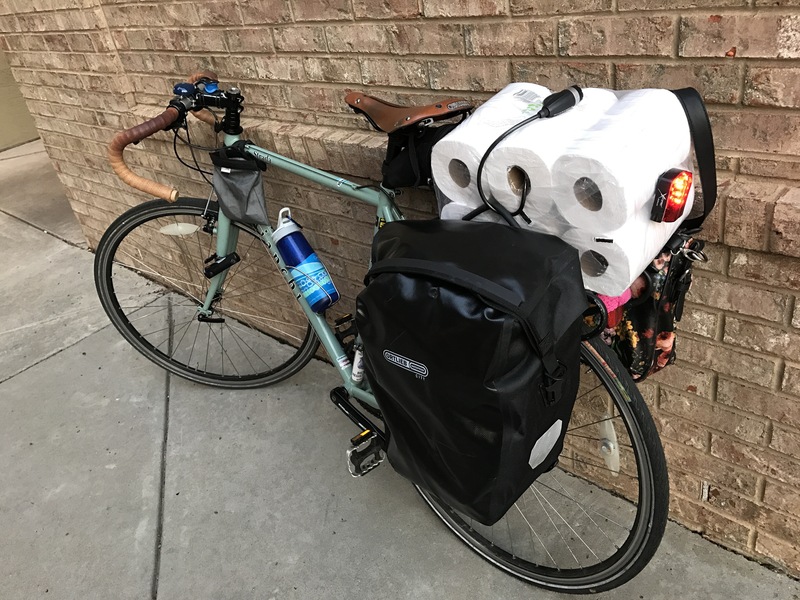 In this episode of “meh I can get that home”, I decide to stock up on TP on a grocery run with one pannier. Luckily I keep a small backup lock in my work bag, and my rear light has a clip on the back for easy repositioning.